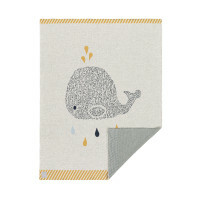 The high-quality, reversible baby blanket (75 x 100 cm) with the little whale is a great accessory. Product information "Knitted Blanket GOTS Little Water Whale"
LÄSSIG’s knitted baby blanket with the little whale is warm and cozy and is ideal to snuggle up in. These wonderful, heavenly soft knitted blankets, size 75 x 100 cm, never fail to inspire every parent with their versatility: as a pad, a rug to crawl and play on, a cot cover, or simply to snuggle up in. This high-quality collection is ideal for babies and small children. 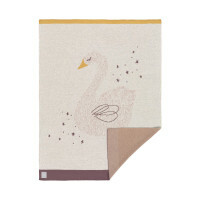 Made in attractive colors and ultra-soft cotton, this blanket will become your child’s favorite snuggly. The blankets' double-sided design makes them reversible and provides for change. They are made from 100 % organic cotton and are produced and certified in accordance with the GOTS guidelines (Global Organic Textile Standard). This great accessory is available in various colors and designs.